No matter what Banana Phone might promise, it will not enhance your overall computer experience. In fact, we suggest that you remove this adware application because it was developed by the notorious SuperWeb LLC. This collective is responsible for creating dozens of identical advertising-supported programs (Spice Nice, Sad Cloud, Dollar Dream, etc.) that are designed to display banners, pop-ups, coupons, and other advertisements, on target systems. Although these ads might seem only limited to online retailers, you might still notice the general increase in the commercial content on your screen. If you want this advertising material to cease distracting you during your online surfing activities, you will need to delete Banana Phone from your PC. When Banana Phone is installed in target computers, it connects to a remote adware server in order to start sending ads to your browser. This app wants to be smart when it comes to showcasing the content; therefore, it employs specific tools and technologies to collect such marketing-related information as your browsing history, search queries, technical specifications, and other data. This way Banana Phone increases the chance that you will find the commercial content interesting enough to access it. What is alarming about adware in general is that clicking on the featured links can reroute you to third-party sites filled with dangerous infections. You should acknowledge the fact that Banana Phone might easily turn into a threat, and thus hurry up to remove it from your machine. The tags “Ads by Banana Phone” or “Provided by Banana Phone” on your browser might the first indication that this adware app is already on your computer. You might wonder how Banana Phone reached your system, especially considering that the official site getbananaphone.com does not offer a possibility to download this app directly. As computer users shun adware in general, and are not likely to install it on their systems willingly, adware applications rely on software bundles to gain their way to target machines. 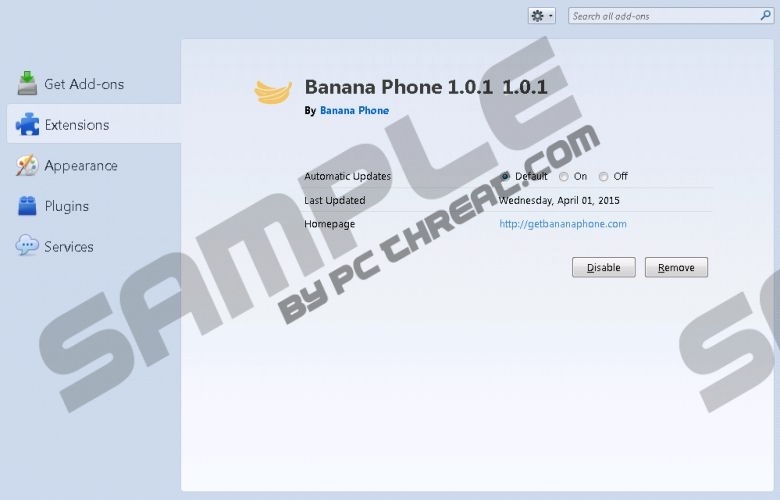 Banana Phone can reach your PC together with other unreliable and unfamiliar programs, which can be dropped on your computer by malicious third-party installers. So, if you are not careful when downloading and installing freeware or shareware from unreliable file sharing files, it is possible that you will need to remove more than one infection from your system. The removal of Banana Phone is straightforward, so you will be able to terminate the app by deleting it from the program list (see the instructions below). However, things tend to get complicated when adware applications start downloading updates or uploading additional questionable content without your permission. Also, remember that Banana Phone might get deployed to your system with additional dangerous applications. As it can be complicated to locate and remove all those risks by yourself, we recommend that you acquire a legitimate antimalware program that will be able do this job for you automatically. Open Programs and Features and select Banana Phone the list. Tap the Windows key + X and go to Control Panel. Open Add or Remove Programs and select the unwanted application. Quick & tested solution for Banana Phone removal.